Small brother of CX123 coving. Classic cut. A best-seller which has been very successful for a number of years. 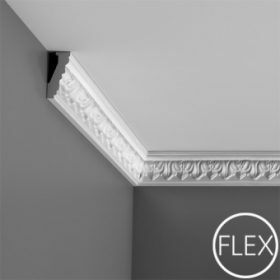 The cornices of the Axxent collection are affordable yet elegant and durable. When incorporating ornaments, keep in mind the following design principles: scale and proportion, balance, rhythm, emphasis and harmony. Exists in Flex. Flex profiles are really versatile and the finish is far superior to anything one could ever achieve with timber. 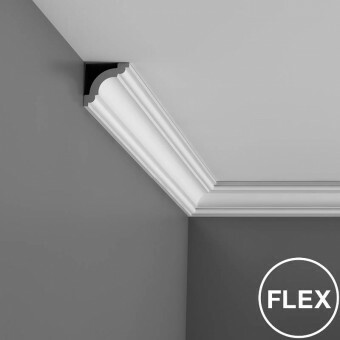 Especially with design being pushed to its limits these days; rounded lines, circles and curves galore, you will install those flex to your walls and ceilings without any effort at all! Coving and Mouldings Ltd is part of Orac Group. We are distributors of Orac Decor brand in the UK. 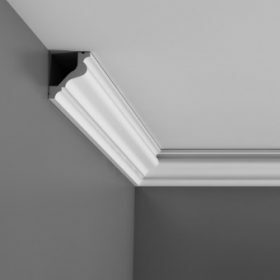 Orac is a leading manufacturer of innovative 3d elements specialising in decorative coving, dado rails, panel mouldings, indirect lighting profiles, skirting and ornaments. Since 1970 we have developed and manufactured decorative mouldings with passion, pioneering the use of synthetics technology in the production of decorative elements for your home.